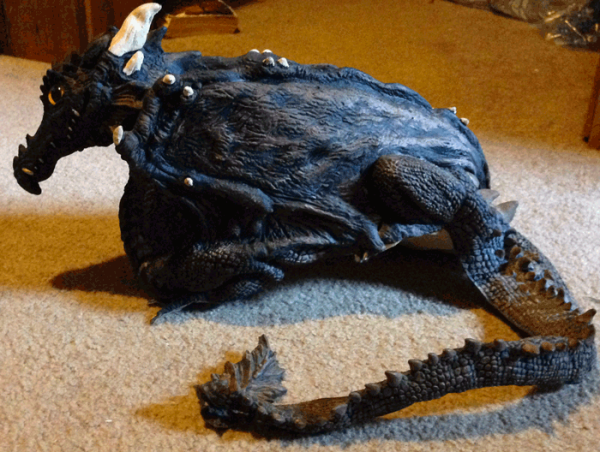 Realistic latex, shoulder perching pet dragon costume accessory. 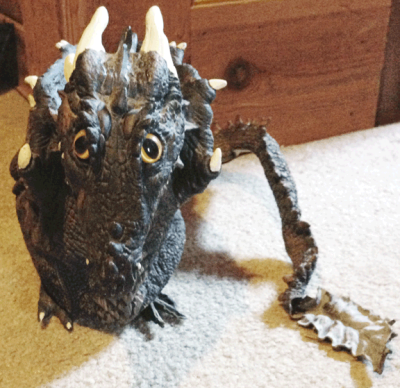 This little latex dragon would make a good costume accessory for anyone who wanted to dress up as Daenerys from Game of Thrones. 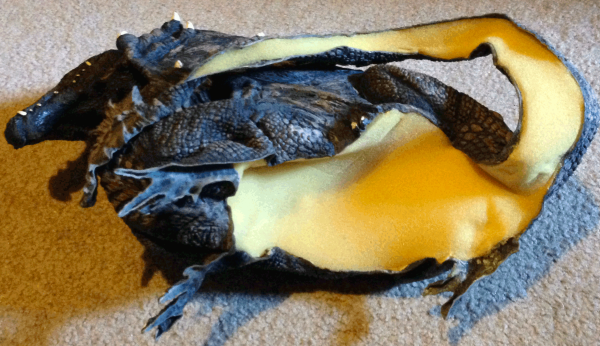 It's made of latex rubber so it's very bendable, and stuffed inside with foam rubber as shown in the pictures below. The coloring is matte except for the glossy, yellow, catlike eyes. It has been built slightly curved in the center so that it will perch more comfortably on your shoulder, but it's not a perfect fit and will need to be pinned or otherwise attached in place. The bend in the base will also not allow it to easily sit up free standing on it's own. 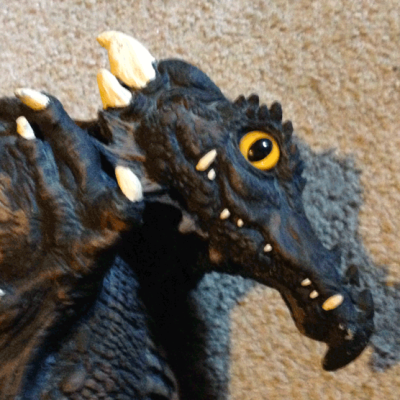 This little dragon is about 20 years old. It's never been used for anything other than to sit on a shelf as a decoration, and so is in very good shape. It's about 16 inches long, 9 inches tall and less than 5 inches wide. These measurements don't include the tail, which is meant to curl around it's body and drape down the front of your costume. The tail by itself is about 19 inches long. It weighs about 10 ounces total. It does have a maker's mark tucked in between it's wings, and it is a collectible. 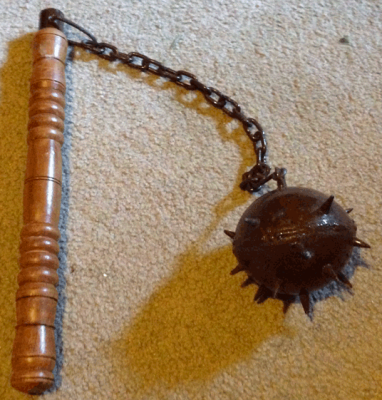 Morningstar, Mace, Flail, Spiked Battle Ball. Although it's not real and meant to be decorative, this thing is very dangerous. 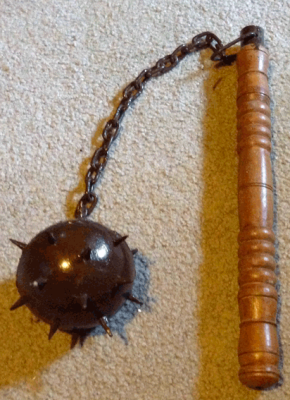 It's real wood with a metal chain, with a real spiked metal ball that would do some very serious, ugly damage if used. So please do not buy this for a kid - it's meant to hang on a wall amongst other Medieval display items. 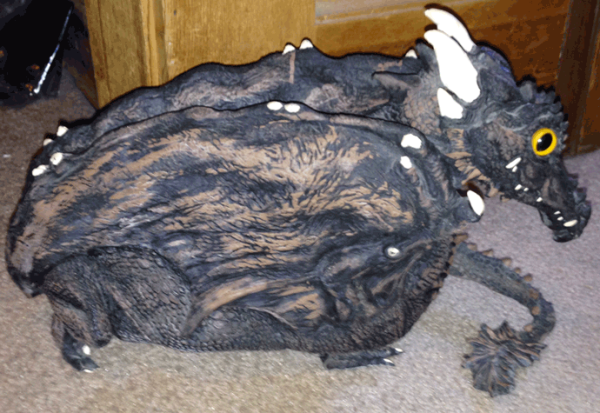 This one was displayed next to a huge latex dragon head for years. It's about 20 years old. There is no maker's mark on it that I can find. 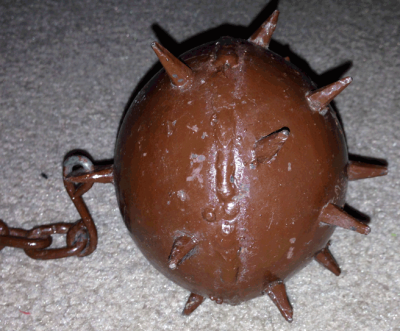 The ball and chain are painted with dark brown enamel. I'm not sure what type of metal it is, probably pot metal. The handle is relatively light and 13 inches long, about an inch thick. The handle weighs about 7 ounces. the chain is about 13 inches long, about 0.5 inches thick. The ball by itself weighs 1 pound, 1.7 ounces and it's about 4 inches around, not counting the spikes. the spikes can be up to a half an inch long. Altogether, the whole thing weighs 1 pound, 11.4 ounces. Please think carefully about having this thing in your house.